The information below is courtesy of the National Cemetery Administration. From Tampa International Airport. Follow signs to 275 north. Proceed on 275 north to Interstate 75. Travel approximately 50 miles to Exit 309 (Webster), which places you on county road 476B West. Cemetery is on the left about 1 mile. Throughout the cemetery there are isolated committal shelters for use by families who wish to hold committal services prior to burial of their loved ones. The main entrance of the cemetery hosts the Public Information Center and cortege lanes for arriving services. All information about the cemetery can be obtained in this location. In November 2001, a columbarium opened to hold cremated remains. Florida National Cemetery staff maintains a list of Veterans Service Organization units that may be contacted to arrange a military honor group in addition to or in lieu of the Department of Defense Military Funeral Honors. Fresh cut flowers may be placed on graves at any time. Floral arrangements accompanying the casket or urn at the time of burial are limited to three for casket burials and one for cremation burials. Flowers will be removed when they become unsightly or it becomes necessary to facilitate cemetery operations such as mowing. A limited number of floral containers are located in bins in front of the burial sections – they are available as a courtesy. These containers are recycled – please do not remove them from the cemetery. Artificial flowers and potted plants will be allowed on graves for a period extending 10 days before through 10 days after Easter Sunday and Memorial Day. Seasonal Holiday Decorations such as Christmas wreaths, potted poinsettias and other seasonal decorations may be placed on graves from Dec. 1 through Jan. 20. No item or object may be attached to a headstone or marker in a national cemetery. Permanent plantings, statues, vigil lights, breakable objects, and similar items are not permitted on the graves. Items considered offensive, inconsistent with the dignity of the cemetery, or considered hazardous to cemetery personnel are prohibited. Florida National Cemetery is located in the Withlacoochee State Forest, approximately 50 miles north of Tampa in Sumter County, Fla. Withlacoochee State Forest was acquired by the federal government from private landowners between 1936 and 1939 under the provisions of the U.S. Land Resettlement Administration. The U.S. Forest Service managed the property until a lease-purchase agreement transferred it to the Florida Board of Forestry in 1958. Currently, Withlacoochee State Forest is the second-largest state forest in Florida, divided into eight distinct tracts of land. In 1980, the Department of Veterans Affairs (VA) announced that it would establish a new national cemetery in Florida, its fourth. Two major locations for the cemetery were studied: Cross Florida Barge Canal and Withlacoochee State Forest. The Withlacoochee site, though more environmentally sensitive, was supported by government officials. On Feb. 15, 1983, the state transferred land to the VA for the development of a Florida National Cemetery. The first interment was in 1988. 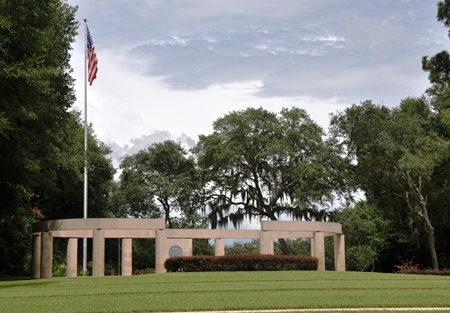 The cemetery features a Memorial Pathway that is lined with a variety of memorials that honor America’s veterans. As of 2003, there were 47 such memorials at Florida National Cemetery—most commemorating soldiers and veterans of 20th-century conflicts. Sergeant Major Franklin D. Miller (Vietnam) U.S. Army 5th Special Forces Group, 1st Special Forces. Kontum Province, Republic of Vietnam, Jan. 5, 1970 (Section ML, Grave 1). Master Sergeant James R. Hendrix (World War II) U.S. Army, Company C, 53rd Armored Infantry Battalion, 4th Armored Division. Near Assenois, Belgium, Dec. 26, 1944 (Section MOH, Site 1). Major David Moniac, (2nd Seminole War) LT 6th U.S. Infantry Alabama Mounted Creek Volunteers, First Native American Graduate USMA Class of 1822, KIA Wahoo Swamp, Dec. 25, 1802 – Nov. 21, 1836 (Section MD, Grave 1). First Lieutenant Thomas Buchanan (Civil War), Oct. 7, 1825 – June 13, 1863 (Section MD, Grave 39). Private Albert J. Emery (Spanish American War) 7th U.S. Cavalry, 14th Division, Sept. 15, 1877 - Aug. 30, 1957 (Section 103, Grave 383). MSGT Alfred Alonzo, Sr., (Korea) U.S. Army, assigned to Headquarters Company, 2nd Battalion, 8th Cavalry Regiment, 1st Cavalry Division. MSGT Alonzo was reported missing Nov. 2, 1950 near Unsan, North Korea, and was presumed dead three years later. His remains and those of 10 other American soldiers were discovered in the year 2000 after a North Korean farmer told authorities he had uncovered human remains he believed to be Americans. A team of representatives from the Joint POW/MIA Accounting Command (JPAC) and the Democratic People’s Republic of North Korea, excavated the burial site and uncovered the remains of at least 10 individuals. Through DNA testing at the JPAC, MSGT Alonzo’s remains were identified, and his family notified. He was awarded the Purple Heart Medal and his headstone also states killed in Action (KIA), World War II (WWII) and Korea. MSGT was buried on Nov. 10, 2006 (Section 402, Grave 53-A). Mike Holovak (World War II) U.S. Navy, Skipper of PT Boat in the South Pacific credited with sinking nine Japanese ships; retired as a Lieutenant Commander. Prior to joining the Navy, Holovak was an All-American football player at Boston College; he was starting fullback on the college’s 1941 Sugar Bowl championship team and set the rushing record during the 1943 Orange Bowl game, which remains unbroken. After the war, he played professional football for the Chicago Bears and the Los Angles Rams. He went on to coach at Boston College and later was named the second head coach of the Boston Patriots. He went on to hold administrative positions with other professional football teams until his retirement in 1998. Holovak was buried on Jan. 30, 2008 (Section 327, Grave 949). Click on this link to view the burial records for FNC, Bushnell, Florida on Interment.net. 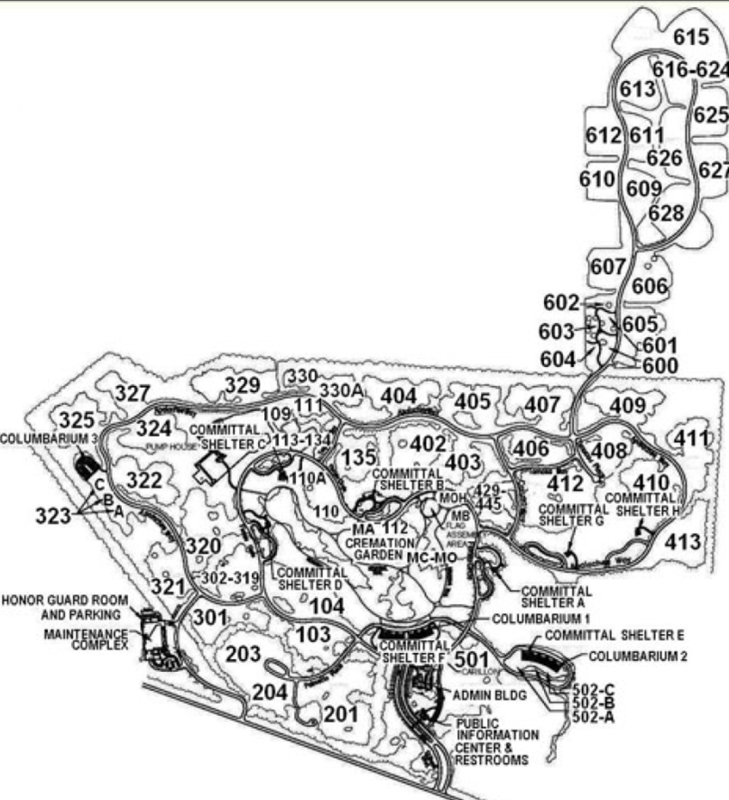 Florida National Cemetery Burial Inventory.